The first departments established were the Faculty of Arts at Elphinstone College in 1835 and the Faculty of Medicine at Grant Medical College in 1845. Both colleges existed before the university was founded and surrendered their degree-granting privileges to the university. The first degrees awarded in 1862 were Bachelor of Arts and Licentiate in Medicine. Initially, the Town Hall in Mumbai was used as the university's offices. Cornelia Sorabji, who later studied law at Somerville College becoming Oxford's first female law student and India's first female advocate, was the university's first female graduate in 1888. Until 1904, the university only conducted examinations, awarded affiliations to colleges, developed curricula and produced guidelines for colleges developing curricula. Teaching departments, research disciplines and post-graduate courses were introduced from 1904 and several additional departments were established. After India achieved independence in 1947, the functions and powers of the university were re-organised under The Bombay University Act of 1953. The name of the University was changed from University of Bombay to University of Mumbai in 1996. In 1949, student enrollment was 42,272 with 80 affiliated colleges. By 1975, these numbers had grown to 156,190 and 114 respectively. The Kalina campus in suburban Mumbai covers an area of 93 hectares (230 acres) and houses graduate training and research centres. Departments offering courses in the sciences, technology, commerce, and humanities are located here. Most colleges of engineering and medicine affiliated to the University of Mumbai, though, are privately owned. The university does not have its own engineering or medicine departments. The Thane Campus, established in 2014, spans an area of 2.4 ha (6 acres) and is a modern, two-storey complex. It houses administrative offices, the School of Law, University of Mumbai and also undertakes management courses. The University of Bombay was established in 1857 at the Fort campus, which is located near the southern end of Mumbai island. It houses the administrative division of the university on a 5.3 ha (13 acres) site. It has 116,000 m2 (1.25×10^6 sq ft) of built-up area, 2,000 m2 (22,000 sq ft) of classrooms, and 7,800 m2 (84,000 sq ft) of laboratory space. There are two post-graduate centres, 354 affiliated colleges, and 36 departments. It is built in the Gothic style and the Rajabai Clock Tower stands on the lawns of the campus. One of Mumbai's landmarks, the Rajabai Clock Tower was completed in the 1870s and houses the University of Mumbai's library. Sir George Gilbert Scott modeled the Rajabai Clock Tower on the clock tower of the Palace of Westminster in London. Local businessman Premchand Roychand contributed to the cost of construction and named the tower in memory of his mother, Rajabai. The tower is 85 m (280 ft) tall and has five storeys. At a height of 9.1 m (30 ft) from the ground, there are eight statues representing the Indian castes. The tower clock is reported to have played 16 tunes including Rule, Britannia. On the initiative of the then Vice-Chancellor, Dr. Rajan Welukar, the first phase of restoration of Rajabai Clock Tower started in 2013 and was completed in May 2015. Tata Consultancy Services (TCS) gave a Rs 4 crore grant for this phase of the restoration project. This minor campus, running mostly extramural courses, is located in the town of Ratnagiri. Several departments of the University of Mumbai are located away from the three Mumbai campuses. These include the departments of Medicine and Medical Research located in several prominent hospitals in Mumbai, such as the Tata Memorial Hospital, Bombay Hospital and G.S. Medical College and King Edward Memorial Hospital. The Institute of Chemical Technology, then known as the UDCT, was originally an institution of MU, but later gained university status. Tata Memorial Hospital is now affiliated to the Homi Bhabha National Institute. Similarly, Veermata Jijabai Technological Institute was the first Engineering Institute in the University of Mumbai (1887) and Thadomal Shahani Engineering College was the first Engineering college in the University of Mumbai to start courses in Computer Engineering, Information Technology, Electronics Engineering and Biomedical Engineering. Sardar Patel College of Engineering is another engineering college affiliated to the University .. Further, K.J. Somaiya College of Engineering is additional engineering college affiliated to the University. Along with these, D.Y.Patil's Ramrao Adik Institute of Technology is also affiliated to the University of Mumbai. The Jamnalal Bajaj Institute of Management Studies was established in 1965 in collaboration with Stanford Graduate School of Business of Stanford University. Sophia College for Women was established in 1941. Jawaharlal Nehru Library (JNL) is the central library, located on the campus at Kalina. The technology and applied research journals and books of the University of Mumbai are kept in the libraries of the Institute of Chemical Technology, Tata Institute of Fundamental Research, Jamnalal Bajaj Institute of Management Studies and Tata Memorial Hospital. The University of Mumbai has several hundred affiliated colleges offering undergraduate and post-graduate education, and conducting research in areas of science, commerce, arts, engineering, management, law, etc. Each college has its own campus and specialized departments/centres. Internationally, the University of Mumbai ranked 801–1000 by the QS World University Rankings of 2018, 181 in Asia and 82 among BRICS nations. The National Institutional Ranking Framework (NIEF) ranked it in the 151–200 band among universities in India in 2018. Memoranda of Understanding (MoUs) have been signed with University of Amsterdam, University of Bath, Liverpool Hope University, Ryerson University, IESEG School of Management, Kühne Logistics University, Tianjin University of Technology, Nankai University in China and Edith Cowan University in Australia. ^ "Hon'ble Vice Chancellor". mu.ac.in. Mumbai University. 22 July 2014. Retrieved 3 May 2018. ^ "Mumbai University records 60% rise in students" : DNA – Daily News and Analysis newspaper article, Monday, 21 March 2011. ^ a b c d e f Aroon Tikekar (2006). The Cloister's Pale: A Biography of the University of Mumbai (2nd ed.). Mumbai: Popular Prakashan. ISBN 978-81-7991-293-5. ^ "University strengthens ties with India". Cherwell. 13 December 2012. Archived from the original on 22 February 2014. ^ Ṭikekara, Aroon (2006). The Cloisters Pale (2nd ed.). Mumbai: Popular Prakashan. p. 327. ISBN 978-817991293-5. ^ "Alkesh Dinesh Mody Institute". Mu.ac.in. Retrieved 31 January 2012. ^ "Rajabai Tower Mumbai: Tourist Attractions in Mumbai". Mumbailocal.Net. 7 November 2010. 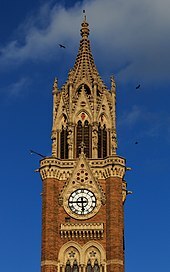 ^ "Mumbai's iconic Rajabai Clock Tower reopens after renovation". ^ "..:: Directorate of Technical Education, Maharashtra State, Mumbai ::." www.dtemaharashtra.gov.in. Archived from the original on 1 September 2015. Retrieved 13 April 2018. ^ "Hon'ble Vice Chancellor". mu.ac.in. 22 July 2014. Retrieved 13 April 2018. ^ "Indian students should consider studying in China". Hindustan Times. 29 November 2011. Archived from the original on 14 January 2012. Retrieved 31 January 2012. Wikimedia Commons has media related to University of Mumbai.